A recent and comprehensive study by researchers at Albert Einstein College of Medicine in The Bronx, New York City found toddlers who snore are more likely to develop behavioral problems like hyperactivity once they reach school-age. The March issue of Pediatrics analysed ‘sleep-disordered breathing’, studying over 11,000 children’s behaviour, over a six-year-period. Researchers found, ‘children whose sleep-disordered breathing peaked at 6 or 18 months of age were between 40 and 100 percent more likely to develop behavioral problems by age 7, compared with kids who breathe normally during sleep.’ What’s more, children with the worst behavioral problems had breathing problems in sleep throughout their infancy, peaking when they were 30 months old. What does snoring have to do with bad behavior? Researchers believe reduced oxygen flow to the brain disrupts restorative sleep; these are critical periods in a young child’s brain development. This disruption, in turn, creates problems in areas of the brain that control babies and toddlers ability to be attentive, control behaviour, regulate emotions and they experienced increased hyperactivity. What can be done to prevent future behavioral problems in snoring toddlers? 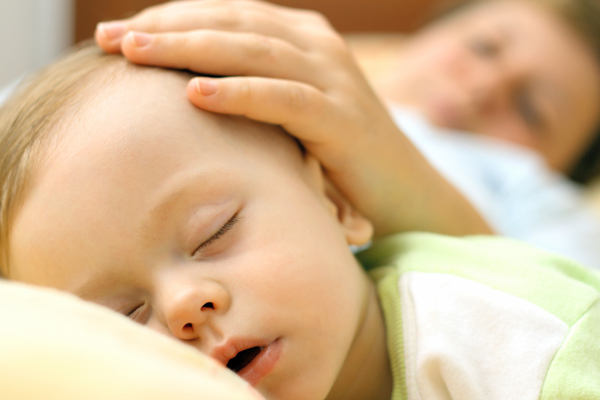 Parents should pay close attention to how their kids sleep and if they notice any issues of sleep-disordered breathing they should consult their pediatrician for guidance and possible referral to an ear, nose and throat doctor or a sleep specialist.